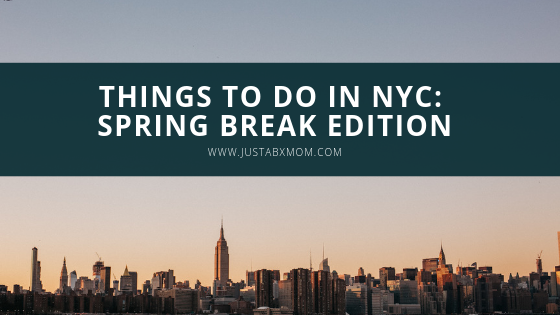 It seems like every year the spring break season gets longer and longer in NYC. Between charter schools, public schools, and independent schools it seems that there have been NYC students going on break since right after we got back from Winter Break! We have been watching friends visit very exciting places on their breaks and we are super excited about plans. A lot of our friends will be staying in town for the break so we wanted to put together a fun list of things that they can do while school is out. The best part about this list is that even if you’re not on break you can still enjoy a lot of these events. Central Park Conservancy –Discovery Walks for Families! The North Woods is the largest of the Park’s woodlands, offering a 40-acre forest retreat in the middle of New York City. Learn about the design of this serene landscape and how the plants and trees contribute to the health of an urban woodland community. Discover the thousands of blooms in Conservatory Garden, the only formal garden in Central Park. Learn about its history and design, investigate the differences between various flowers, and see what it takes to maintain a healthy and beautiful landscape. The rocky landscape surrounding the Harlem Meer has a storied history. Join our guides to learn more about how the area has changed over time, the plants and animals that live there today, and how the Conservancy cares for this complex ecosystem. Presented by City Parks Foundation, Puss in Boots is the story of two friends – Fergus Mundingle and his sly cat Puss – who are tired of their dull and penniless lifestyle. Looking for a change, Puss dons a snazzy pair of boots and sets off on a magical journey, proving himself a caring friend willing to help at any cost. Please note that the schedule is subject to change. Be sure to check cityparksfoundation.org/swedish-cottage-marionette-theatre for most current schedule. Directed and choreographed by Stephanie Klemons, the Tony award-winning Associate Choreographer of the smash musical Hamilton and mommy-to-be! What do you do when you get up before your parents on a Saturday morning? If you’re six-year-old Sadie, you take your favorite stuffed animal on a world-wide adventure, without ever leaving your bedroom! This is Sadie runs for approximately 50 minutes. Best for ages 3-8. We absolutely love visiting the museum. In fact, right before JustaBXgirl went on Spring Break we attended a school trip there. It was her first school trip so we were very excited that it was to a place she was familiar with visiting. It made the idea of going on a field trip a bit less intimidating. If you haven’t had the chance to visit the museum lately then Spring Break is a perfect time to go. While there, make sure to check out some of our favorite special exhibits like Unseen Oceans and T.Rex. There is so much to learn and enjoy that even if you don’t do the special exhibits you can have a fabulous day there. And don’t forget to check out the Discovery Room. It is one of our favorite places to check out on every visit. Unseen Oceans: This will be on exhibit until August 18th. T.Rex – This will be on exhibit until August 9th. Why Did I Celebrated International Women’s Day With Chick Flick The Musical?